Floating Ads are basically Cash Generating Ads looks similar to Google\\s Adsense™ but with more Sense, \\floating\\ on your web page. These Ads re-position itself whenever the page is scrolled. That means, when your website visitor scroll up and down the page, this ads will not go up and down with other contents of the page. These Ads will be there floating on a visible portion to get maximum exposure to the public. Visitors will see Highly Targeted (content based) Randomly selected Ads in your Website on every visit. You can control the whole system by adding a single line of code in your site Generated by FloatingAd Creator™. In addition to the above benefits, your Floating Ads will work as a Viral Marketin Tool. When people see your FloatingAds, they will also notice the links at the bottom saying \Powered by FloatingAds Creator\, and when they click on that link, they will be forwarded to your sales page. Since you get Master Resale Rights to this package, you will get 100% of the Sales coming from those link. 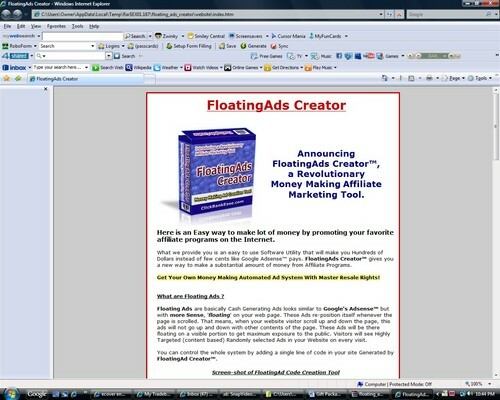 Floating Ad Creator asdf 32222384 12.00 unlimiteddownload Fresh Download Available!